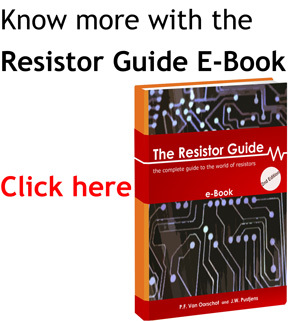 The resistance of a resistor is dependent on its material and shape. Some materials have a higher resistivity, causing a higher value. The value is often printed on the resistor with a number or in the form of a color code. The concept of current, voltage and resistance can be explained by a hydraulic analogy. A flow of water through a pipe is restricted by a constriction. This causes a pressure drop after the constriction. The flow of water is equivalent to electric current. The pressure drop is equal to the voltage drop. The constriction is equivalent to the resistor, and has a certain resistance. The resistance is proportional to the voltage or pressure drop for a given current. In the hydraulic example, the resistance can be increased by for example reducing the diameter of the constriction. For a resistor or wire, the resistance is in general dependent on the material and the geometrical shape. The influence of the geometrical shape, can easily be explained by using the hydraulic example. A long and narrow tube will have a higher resistance than a short and wide tube. 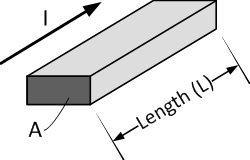 Resistance of a rectangular cross-section resistor with cross-sectional area A and length L.
where ρ is the resistivity of the resistor material (W·m), l is the length of the resistor along direction of current flow (m), and A is the cross-sectional area perpendicular to current flow (m^2). Resistivity is a property of materials. For many materials the resistivity is constant, and V and I are directly proportional to each other. Materials that meet this characteristic are called Ohmic materials. Good resistor materials have resistivity’s between 2·10^-8 and 200·10^-8 W·m. The current through each resistor in series is equal, but the voltage is not. For a more detailed explanation and practical examples, refer to the article resistors in series. Sometimes the desired value is not available with standard preferred values. Instead, to reach the value two resistors can be connected in series or parallel. The voltage across each resistor in parallel is equal, but the current not. For a more detailed explanation and practical examples, refer to the article resistors in parallel. The resistance of a resistor is either printed on the resistor body or marked with a color code. The combination of colors indicated the value and tolerance of a resistor. For a calculator or full explanation, refer to resistor code.